We are blessed with a good traveler. A good airplane traveler, that is. Car trips are another issue, but since we now use a portable DVD player during longer drives, Miss Red tolerates them. 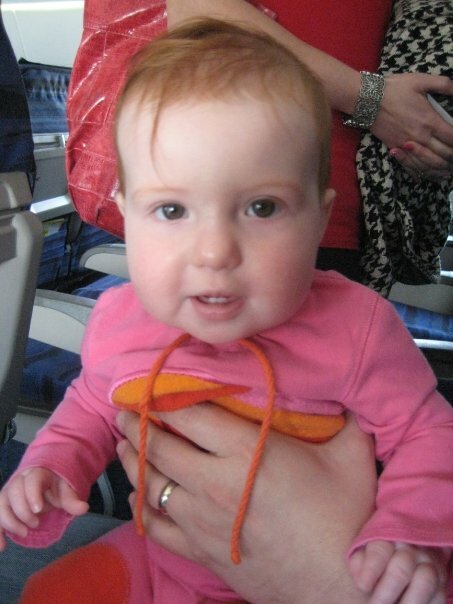 At 8 months, first plane trip. 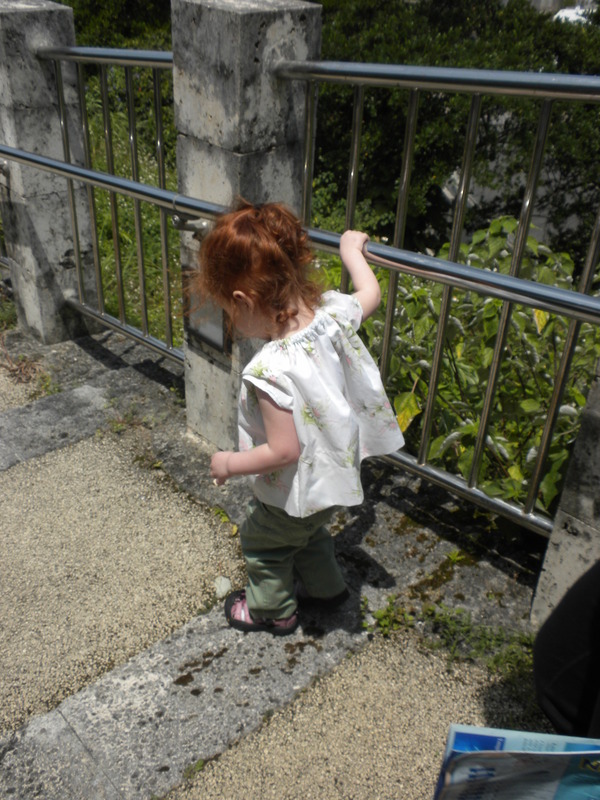 As some of you may recall, we went to Okinawa, Japan in April, with our then 2.5 year-old, and she was amazing. I mean, really truly great. She went with the flow and had a lot of fun exploring. 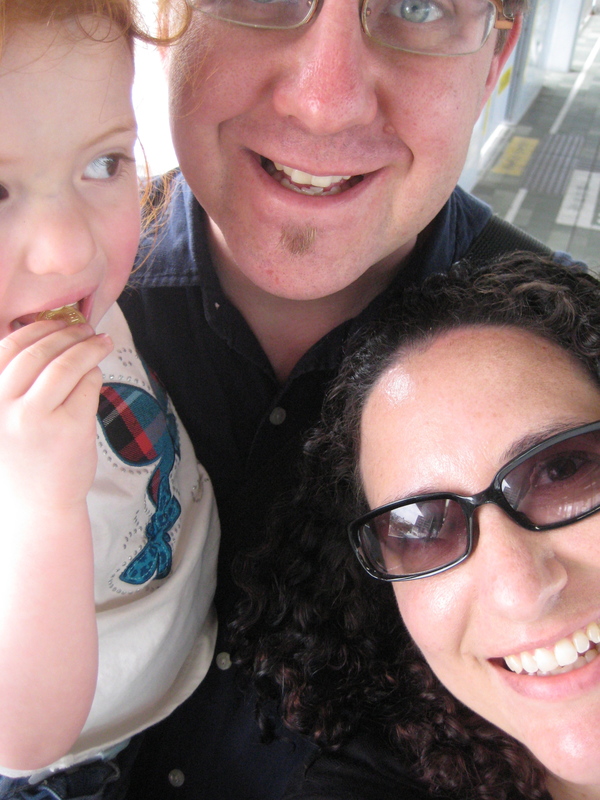 How we survived 15 hours of plane travel with a child who didn’t sleep. She really, truly is. She talks about taking trips. She wants to go to China next, she says. She wants to go to Orangeland and Greenland. She wants to see the ocean again. I love this. I love that she can think of places real or imagined and decide it’s worthy of getting on a plane for. I only hope we can take her there. Where do you hope to take your kids one day? 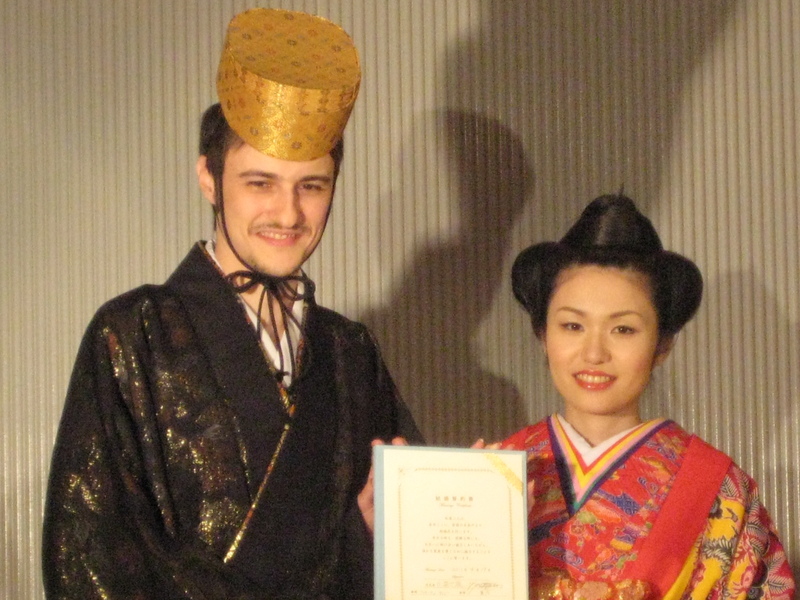 And here we are, the end, for now, of my recounts of Japan. I wanted to end with some of my favorite moments of our time there. As I’ve written, my job has been more than intense lately, and the weight of whether or not I’ll have this job – my favorite so far – weighs heavily on me, well, almost constantly. But being away from everything and unplugging from the constant chatter of the online world, which I love, was so needed. My favorite moment was a ton of moments, where I forgot the day, had nothing to do but spend time with my lovely little family. No cooking, no cleaning, no email, nothing. But time. So Miss Red has red hair. 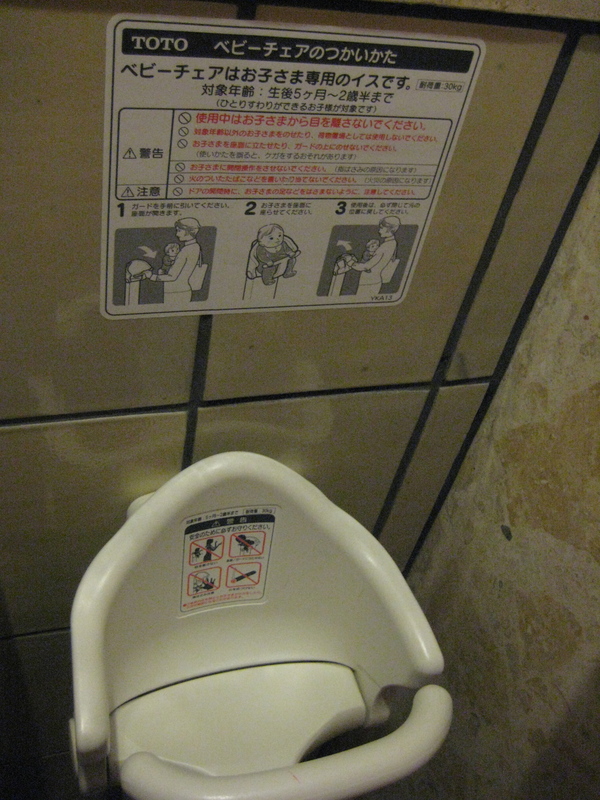 Not so common in America, but in Japan it was like seeing a dinosaur. 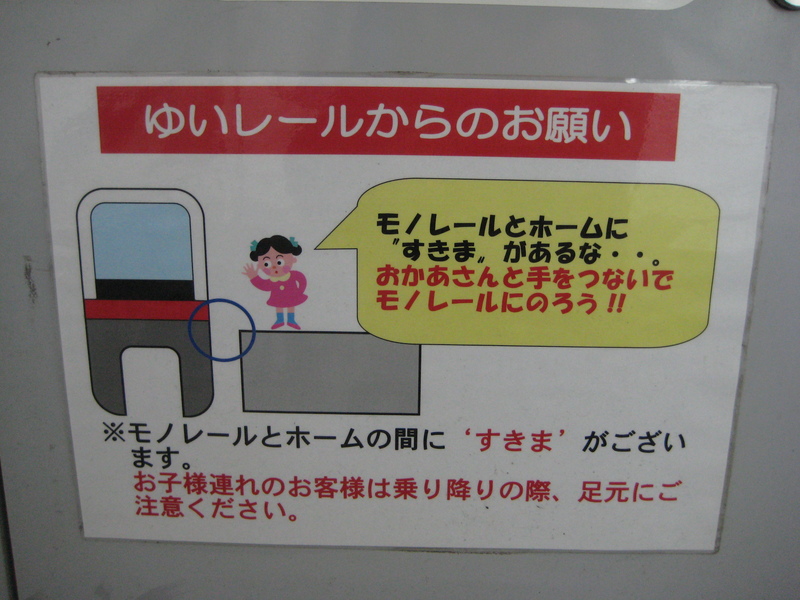 Everywhere we went, and I do mean everywhere, people would smile, comment, and say “kawaii,” cute in Japanese. Older women would reach out and touch her hair, and even thought we didn’t speak the language, we could understand that there was a love of her hair. So much so that Miss Red started to get a little skeeved by it. Understandably so. But one day while exploring a woman approached us and made the mime of taking a picture. We thought she meant of Miss Red, but she then handed her camera to her companion, stopped down and posed with Miss Red. I tried to capture it myself. 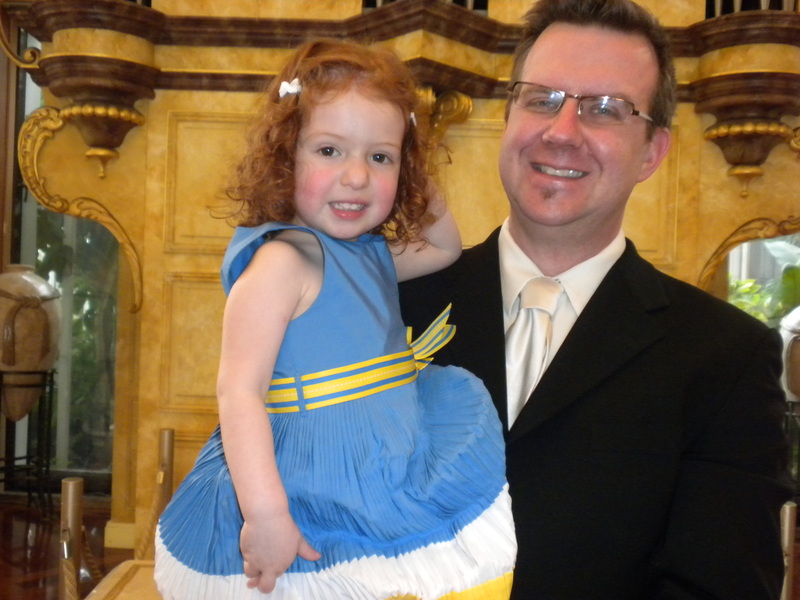 Miss Red, CH and I were in shock, and afterward Miss Red clung to our legs. Understandably so. 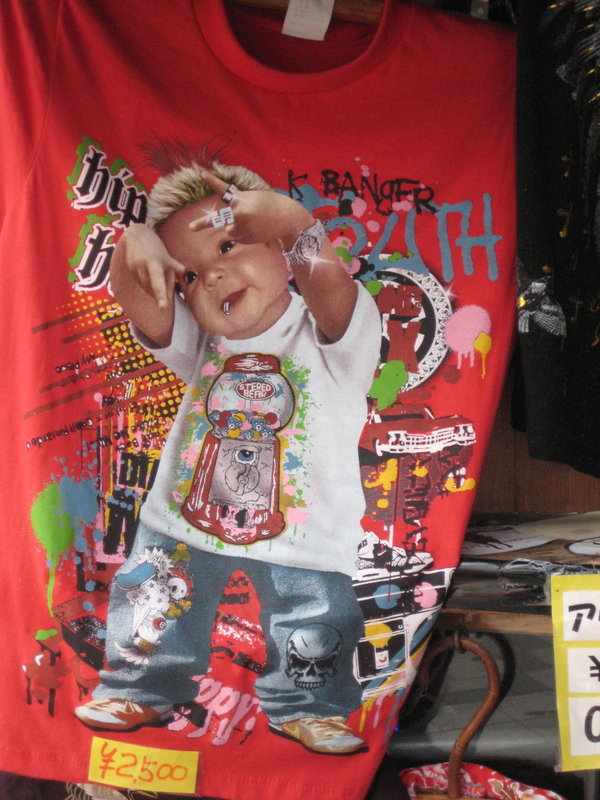 But those memories of the sing-song “kawaii” still rings in my ears. I mean, the girl does have some amazing hair. Miss Red took swimming lessons this winter and let me say that it was one of the more stressful things I’ve done as a parent. For a 30-minute class, it was about two hours or wrangling, with getting us both ready, driving there, getting both of us into the water, showering afterwards and driving home. And she hated it. Like cried for 2/3 of each class and I was the one who mostly went with her. 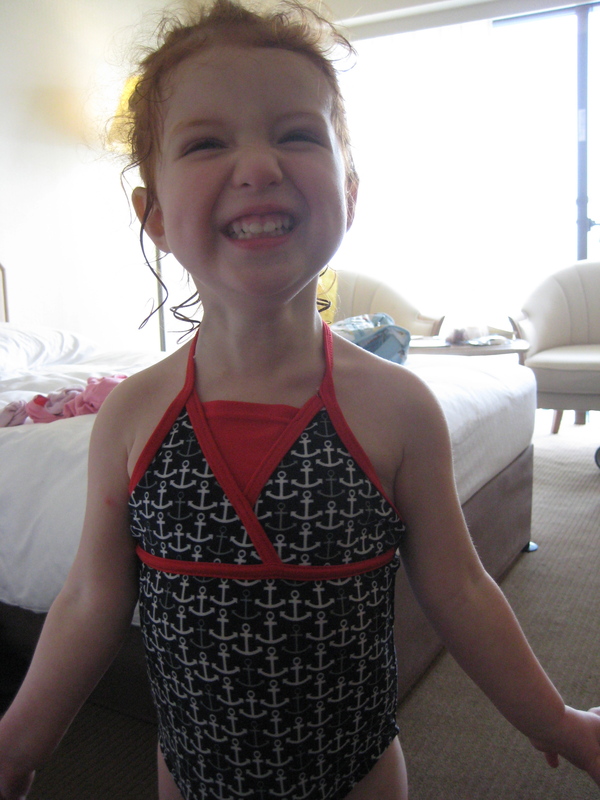 We’ll wait until she’s older for additional lessons, but we were excited to head to the hotel pool in Japan. We didn’t go every day, but as a family we went and CH and I each took her individually and it was so fun. That might seem obvious, but as someone who had to wrestle a slick-as-a-seal toddler in the water, it was so nice to see her, albeit timidly, enjoy herself, and our family, too. One day we took the monorail to Shurijo Castle Park, a complete replica of an castle that was bombed in World War II. It was a long and winding walk to the entrance and Miss Red insisted on walking every. single. step. And she did it. Up and down and all around. I loved seeing her confidently explore and absorb everything as if it were just another day. One morning at breakfast Miss Red made friends with another toddler. They didn’t share the same language, but played for a few minutes, racing back and forth to the large picture-windows over-looking the water. In those five minutes she picked up a cultural cue that many Japanese women use, which is to cover their mouths when smiling or laughing. 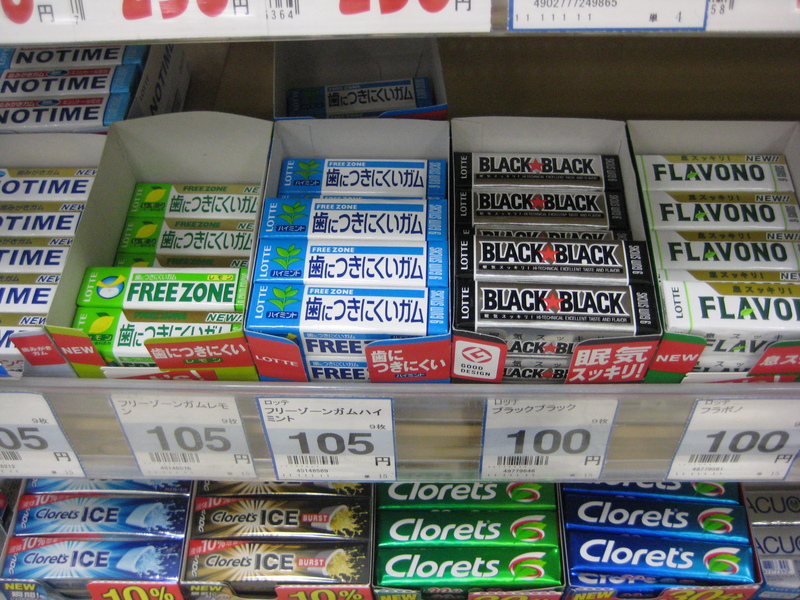 Japanese women even used to blacken their teeth, a practice stopped a long time ago. We had an amazing opportunity to go to Japan and I’ll be eternally grateful for the experiences and time together. 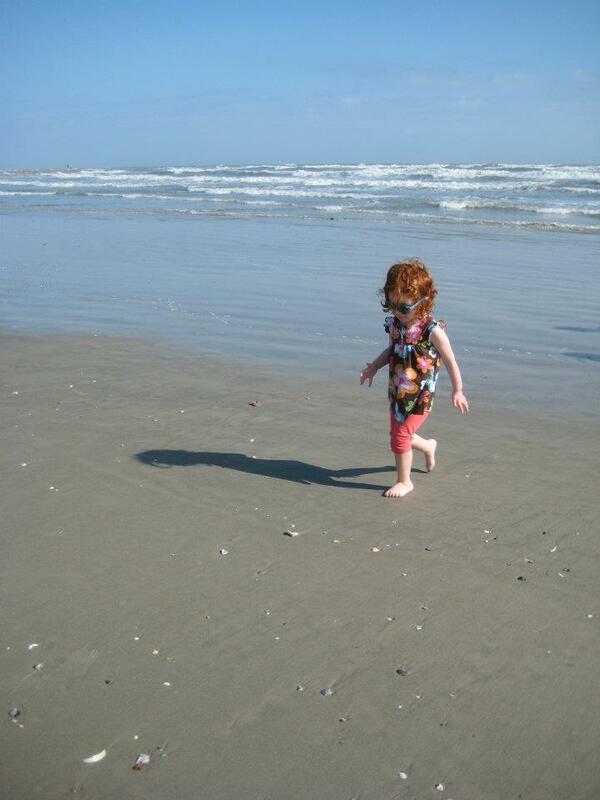 It gave us reprieve from life, and we hope, sparked a travel bug for Miss Red. I would do it again in a heartbeat, and look forward to our family’s next adventures. I wonder where we’ll head next? Alas, for better or worse, I have flat feet (thanks, Dad!). Large, flat feet. That means no fancy high-heeled shoes for me. Danskos it is. Side note: in Madison Danskos can even be considered fancy! But anyone familiar with America knows that we’re trained to perceive the confident sounds of high heels across an airport concourse, or walking down a hall, implies strength and power. Women tower in five-inch heels, never wincing, to slip them off later and hobble around their abodes. Yet, in Okinawa, women wore all types of footwear, sure, but if they wore high heels, they looked really uncomfortable and they didn’t hide that fact. Women would literally shuffle around in spiky shoes too big or too small, taking painful-looking steps and not worrying how it looked. It was interesting, and frankly, a better illustration of how painful most women’s shoes are. This shirt could be yours. As mentioned in a previous post, Okinawa, and Japan in general, is a cash society. We brought cash with us, and fortunately our hotel exchanged money, but many of the family members traveling with us had to find a Post Office to use an ATM that accepted American cards and then exchange money. It wasn’t only the focus of being in a cash society, calculating exchange rates, which fluctuated from 78 to 82 yen to 1 US dollar during our stay, but that money is not something that is directly handled. Everywhere we went, including in taxis, there was a small tray near the register that you placed your money on. Only in returning money did money literally exchange hands. And even then, paper bills were placed first and coins fanned out on top. I found the practice to be quite nice, since it gave a sense of importance to one’s money and made the transaction seem special. 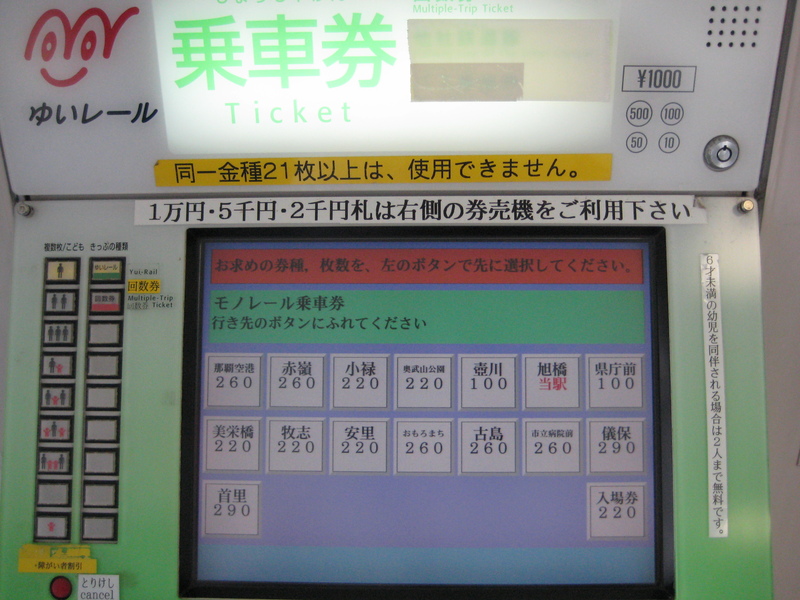 The ticket machine for the monorail. Even babies had their little handkerchiefs, tucked into baby carriers and strollers. Picking out a few fun ones for Miss Red was a neat experience. Painted wall outside of a restaurant. Overall, everything and nothing was different. I’m sure, as Americans, and now knowing cultural nuances, we were at times rude or awkward. But if so, no one pointed it out to us or did we appear to make major gaffes. A few times I told CH to speak softer, only because he has a boomy voice. We did our best to be polite at all times, smile, bow and just be good humans. It seemed to work. Miss Red ready for another day of sight seeing. Next post: some of our favorite highlights. Anything else you’d like me to report on? When we booked tickets for our trip to Okinawa, it would be the first time I traveled to a country where I didn’t speak the language or was with someone who did. In previous instances CH and I could cobble together enough words or traveled to places with a similar enough alphabet that we managed. My main concern? How I would find a bathroom. I’m kind of skeeved out by public restrooms in general, and the thought of being somewhere and not even knowing how to ask for one was beyond me. And Miss Red is “potty training,” so the thought of managing her on a toilet that I didn’t even know how to ask for made me sweat a little. Thanks to Kyle for passing along some of my fears and questions to a friend of his, who sent me two awesome and lengthy emails with some basic phrases and a general course of what to do while in Naha. 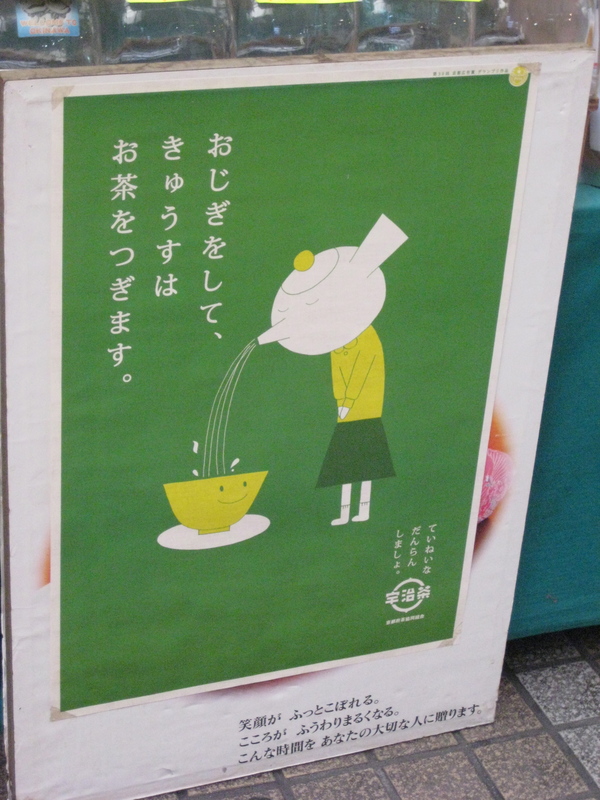 I don't think I need to read Japanese to understand what this poster offers. CH also decided that he was going to teach himself Japanese. He had been to Japan, to Sendai in fact, about 15 years ago with his family, and Grandma had been a number of times, so there were a few Japanese phrase books around Grandma’s house and Miss Red even has a set of Kanji magnetic letters on our refrigerator. He selected the Pimsleur method, one he had had success with when learning French. And that, folks, is one of the many reasons I love CH, in addition to the great skill that you can ask him what was happening in pretty much any year, and he knows something of importance. To keep himself occupied on the treadmill he’ll run through Vice Presidents. Backwards. It worked. He ended up being decent enough to know more than some basic phrases. Along with Grandma, we were actually OK during much of our travels. Having CH’s cousin there to translate the first two days was also amazing, and many people in Japan know a small amount of English. But knowing sumimasen (excuse me, or sorry) and arigato (thank you) helped tremendously. I also learned that a smile and a bow go a long way. When in doubt, I would repeat “sumimasen” and bow. 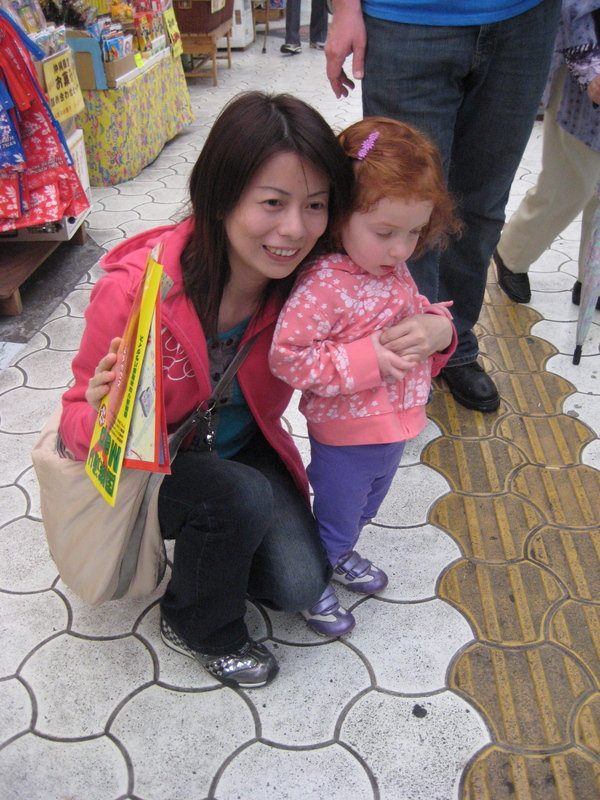 When someone did something nice, I would bow and repeat “arigato.” And people were friendly and understanding. Most restaurants have menus with photos of the meal on them, so we could see what we wanted and point to the waiter. Signs we were able to understand, and we only really got lost once, when CH realized that maps are positioned differently than how we read them. And since I never even attempt to read maps, I let it go. My favorite sign. I walked by it two separate days to work up the nerve to pantomime if I could purchase it and didn't have the guts. And finding bathrooms? They were clearly marked everywhere we went with the standard image of a male or female icon or listed “toilet.” Were they clean? My friends, they were some of the cleanest, albeit tiniest spaces I have ever seen. Some seats were heated (!) and had helpful buttons such as “courtesy noise,” which sounded like flushing. The most awesome thing ever. This holds your baby so you can use the bathroom. Monday’s post? Cultural differences. I mean, there are differences even within a city, but I’ll recap the ones that we found most interesting. Now onto the reason for our travels: to attend a wedding. 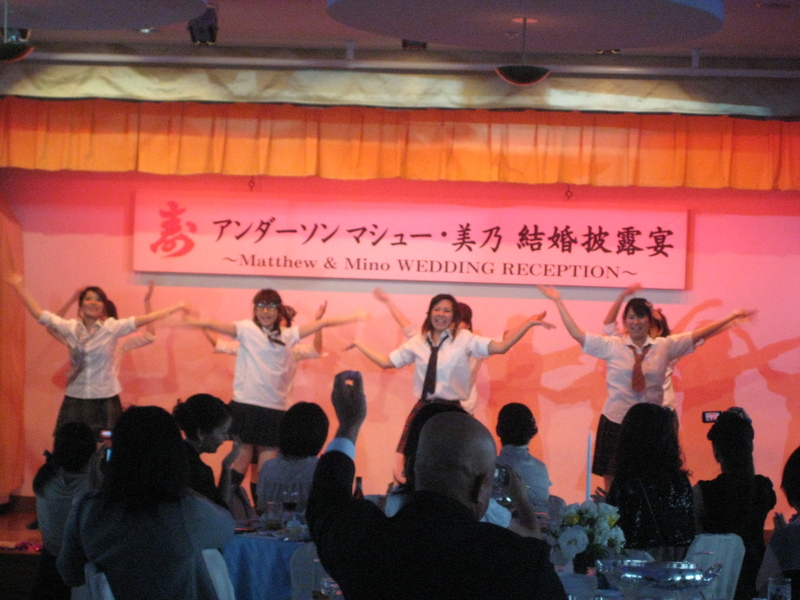 To recap, we headed to Okinawa for a family wedding. You can read more of the background here. A few family members were in the wedding and needed to get to the hotel earlier to get outfitted into kimonos and have their hair done. It took hours, and according to them, was very difficult to eat and breathe. 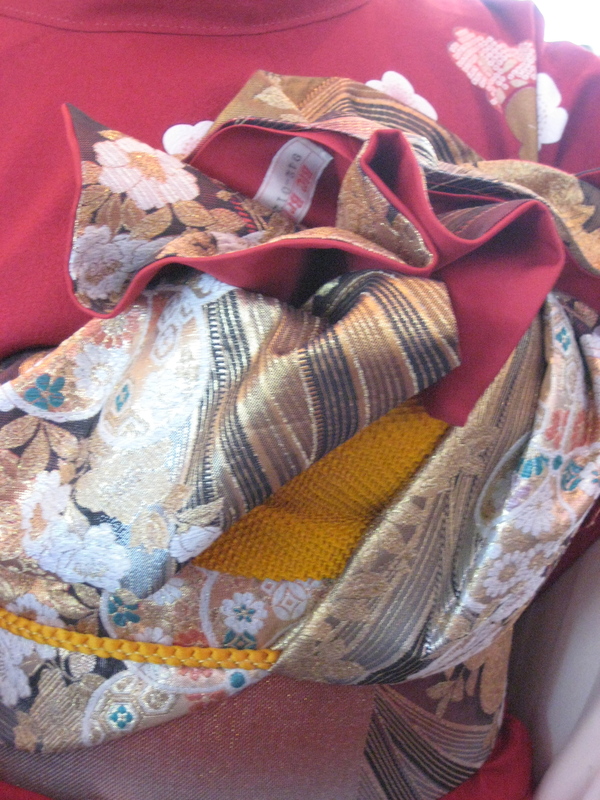 The back of a kimono. 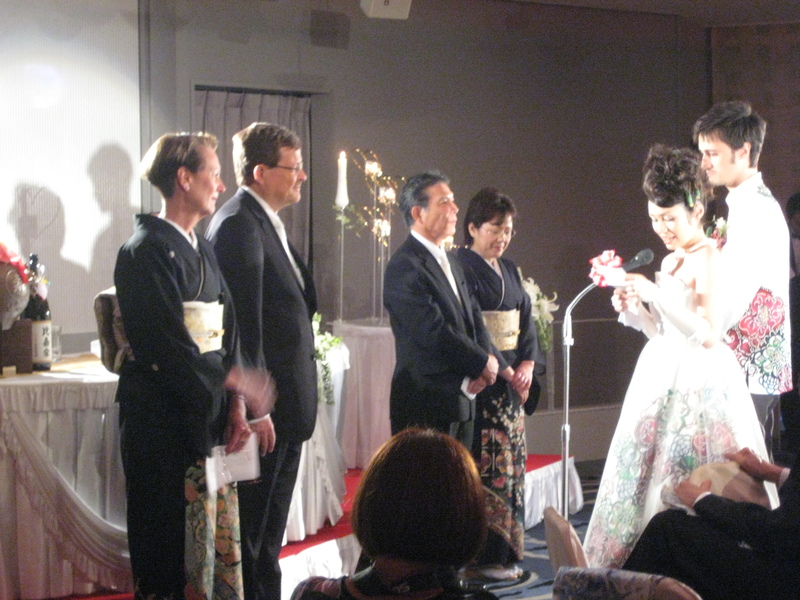 For the wedding itself there was an emcee and a translator. Pretty much everything was said in Japanese first, followed by the English translation. 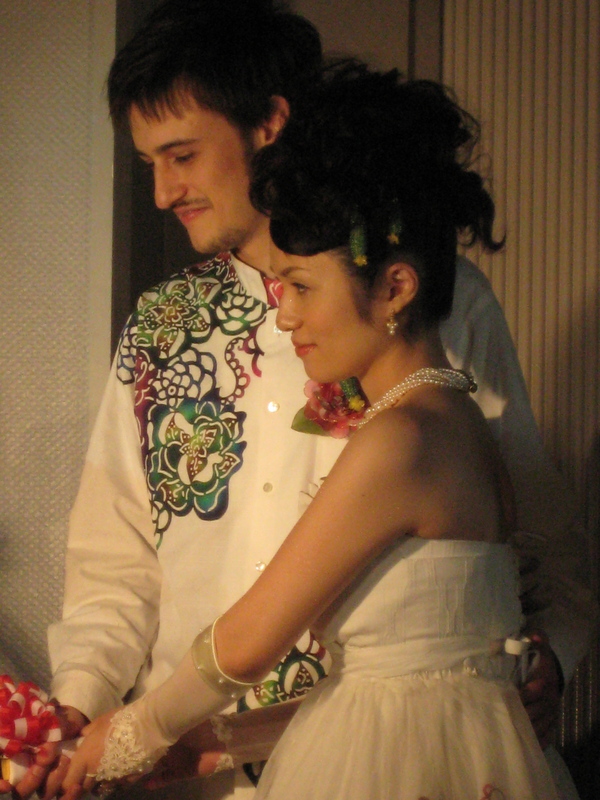 The wedding was amazing – it started with a beautiful dance of the bride and groom, in traditional Okinawan clothing, and his wife’s sisters, along to Okinawan music. It was quite something. My own wedding was a low-key affair. CH and I paid for a majority of it, so cost was a huge factor and it was bare bones: no flowers, no favors, no open bar, etc. What was also another fun contrast was attending Megan’s wedding the weekend we were back, whacked out of our brains by jet lag. Her awesome party, at the local VFW, was so fun in the Madison East-side way and was a perfect welcome home. What followed was really quite fun. Every culture has it’s unique elements of celebration, and this was no different. While there wasn’t a DJ coaxing people onto a dance floor, the bride’s friends and a few co-workers performed to a pop song, dancing and lip synching. Family members danced, again in traditional Okinawan dress, to music, inviting the new family members up. People gave speeches. The food was also great. Large platters of sushi, sashimi, Western food and everything in between was placed on large lazy Susan’s in the center of the table. Out cold, impervious to the speeches and applause, she slept on my lap for a majority of the ceremony and reception. We weren’t able to attend the party directly afterward and headed back to the hotel, where she did wake up and we took her to the pool. But my favorite part of the wedding? When the families read letters to one another. It didn’t matter that we couldn’t understand Japanese and needed to wait for the English translation. We could tell from the emotion what was being conveyed. And that’s what a wedding is about. The ceremony and reception were just that. Ceremonial. There, people get married at a court house and it’s a low-key affair, with really office people as witnesses. So the bride and groom had been married in December, but weren’t considered “married” until the ceremony. It was at that point that they started wearing wedding rings. Another neat part considered traditional was the combining of the waters. In the past couples would bring water from their own villages, combine them, then drink from the same cup. Part of the receiving line was signing in and handing money envelopes. We had a card from the states, so that stood out. You also sign your name, and since we can’t write Kanji, they kindly turned the page sideways for us to write in English. At the end of the reception, the bride and groom stood and posed for photos with people. During the ceremony the emcee would announce when it was a good time to take photos. People would flood the areas and do just that. Next up? How we navigated Japanese. p.s. Have these posts been helpful? Are there any questions I can answer? Are you patiently waiting for me to go back to musings and less recounting? 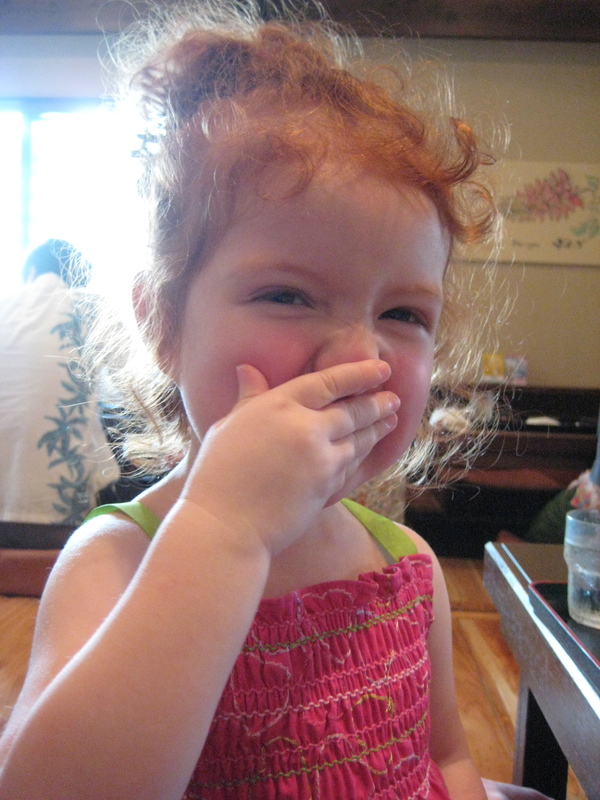 Many people asked me – both before and after our trip – what we ate, and more specifically, what Miss Red ate. I was concerned about food safety given the radiation in Japan, but my fears were quickly abated when the cousin living there pointed out how far away were were from the tragedy. By this point I knew that we would pack a bag of food for Miss Red. I predicted that she would be hungry at awkward times from jet lag – like 3 a.m. or during the middle of our half-day plane journey, and I was right. 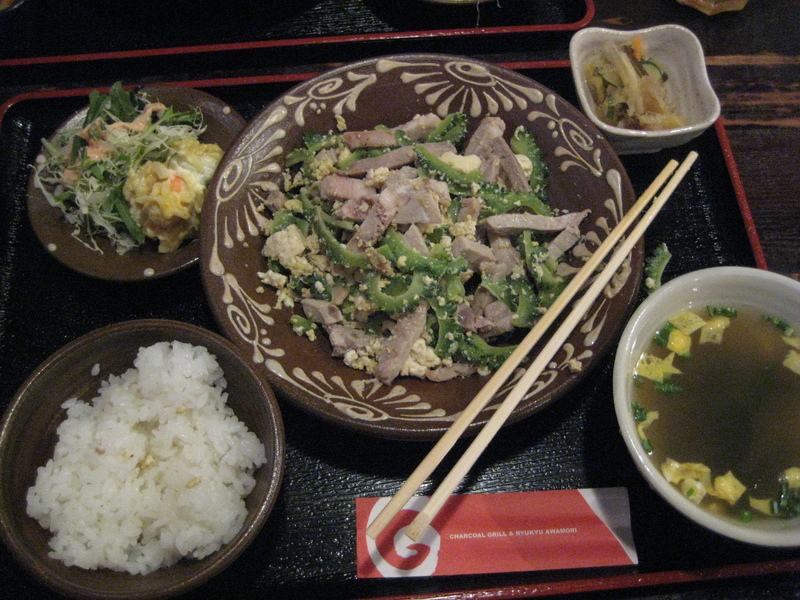 But I also knew that she would need to eat some of the food we encountered in Okinawa. 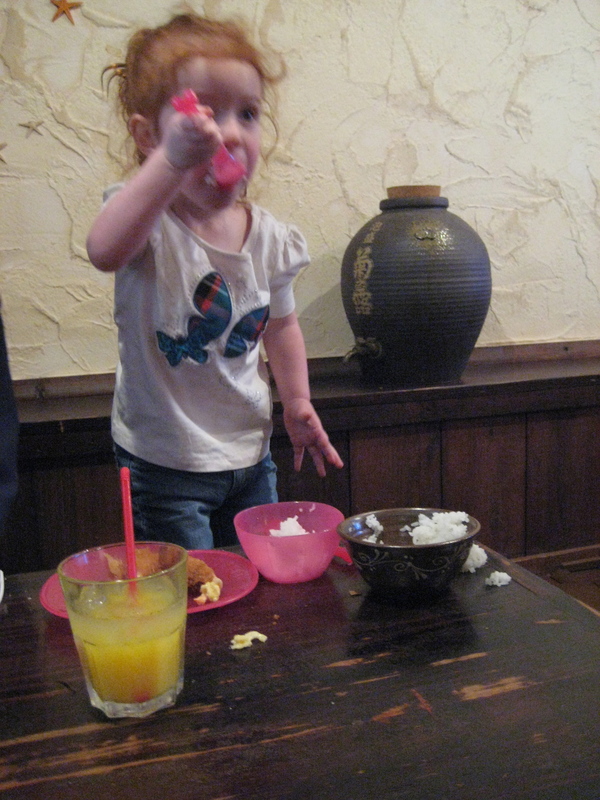 While she didn’t dive right into eating everything on her plate, she did a decent job and attempted chopsticks at each meal. Thanks to a college friend (hi, Molly!) I can comfortably use chopsticks. A few of the American family members on the trip opted for forks the entire time. 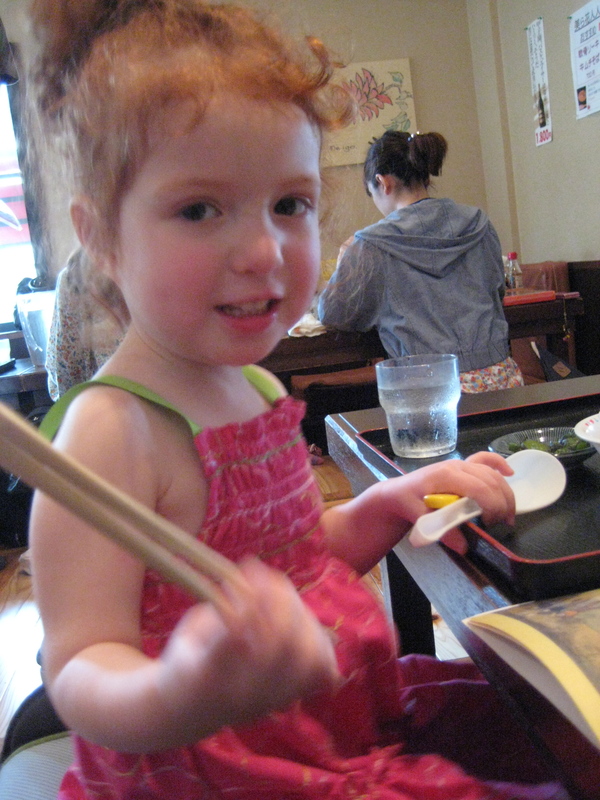 But all Japanese people used chopsticks, even for french fries or other foods Americans would use their hands for. Spoon option for this meal. Each restaurant we went to brought out a plastic bowl and silverware for Miss Red. They called her “baby,” too. The cutest "kids meal" I've ever seen. For Miss Red. We brought food with us wherever we went. Sushi bar? 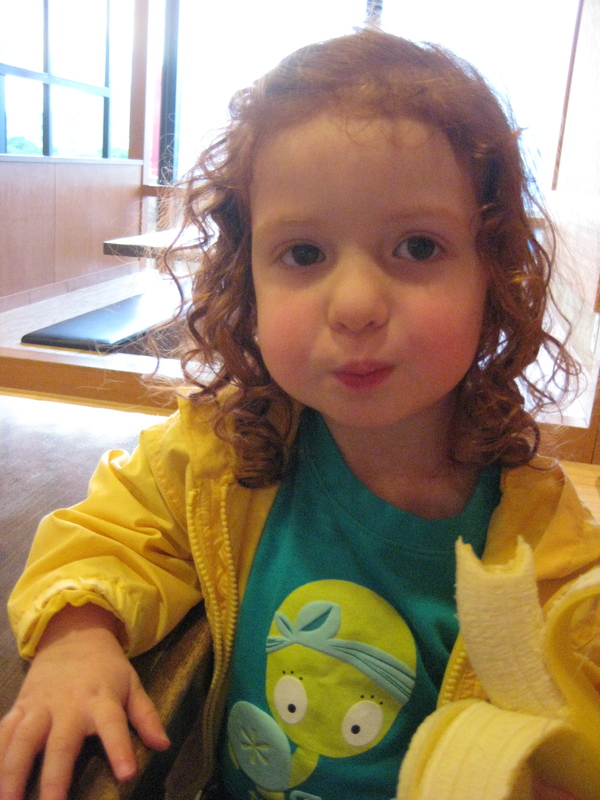 She ate a banana. We ate raw fish. She ate a banana. Where did we get additional food? Fortunately, there was a grocery store across the street from our hotel, which we visited three times during our stay. 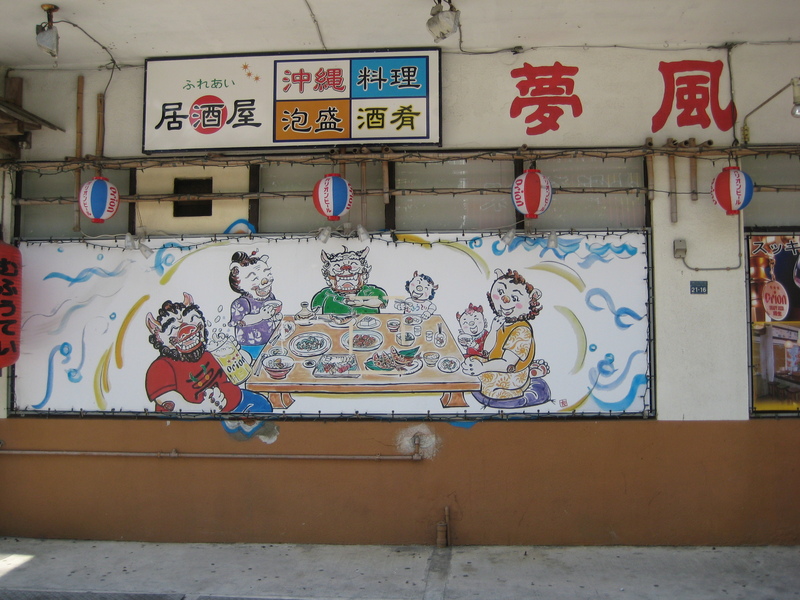 The first time we went we hadn’t exchanged money yet and learned first-hand that Okinawa is a cash society. The grocery store didn’t accept cards of any kind and most ATMs don’t accept American cards. In fact, you have to go to a Post Office to use an American card at an ATM. But the second and third times we went we picked up staples for Miss Red, including milk (about $6 a liter) and cheese (about $6). We tried to hold off on the cheese, but she kept asking for it. Might I add, that being from Wisconsin, and paying $6 for processed cheese is insane. For $6 at home I could have a quarter pound of award-winning aged raw milk cheddar from a specialty shop. Back to dining. Can I say that it’s actually really nice to use chopsticks for all meals? There’s more of a meditation in eating when not literally shoveling food into one’s mouth. And as a fast eater, it allowed me, nay, forced me, for days, to slow down and enjoy the seaweed, vegetables and other new foods. Lunch. Which we ordered by taking a picture of the sign outside and showing the waiter. 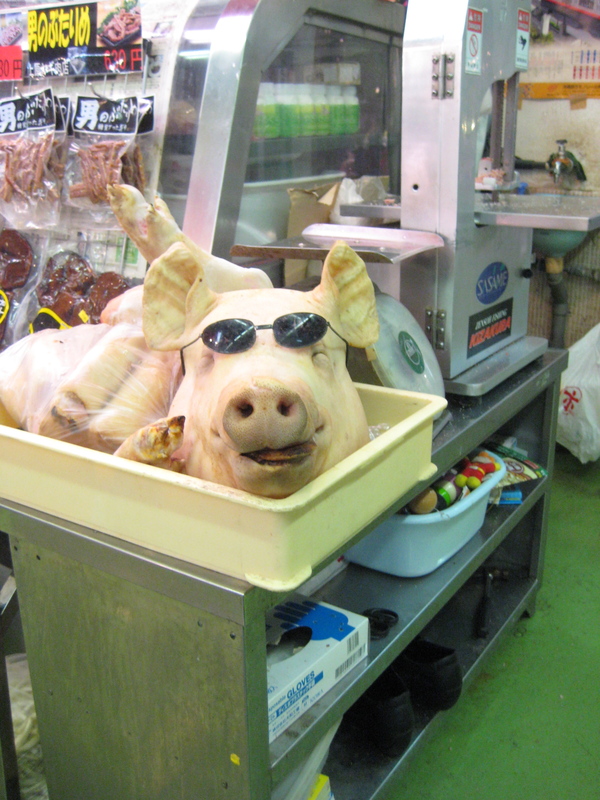 Okinawa is crazy for pork, in addition to fresh vegetables and seafood. I was probably eating pork in forms I wasn’t aware of. 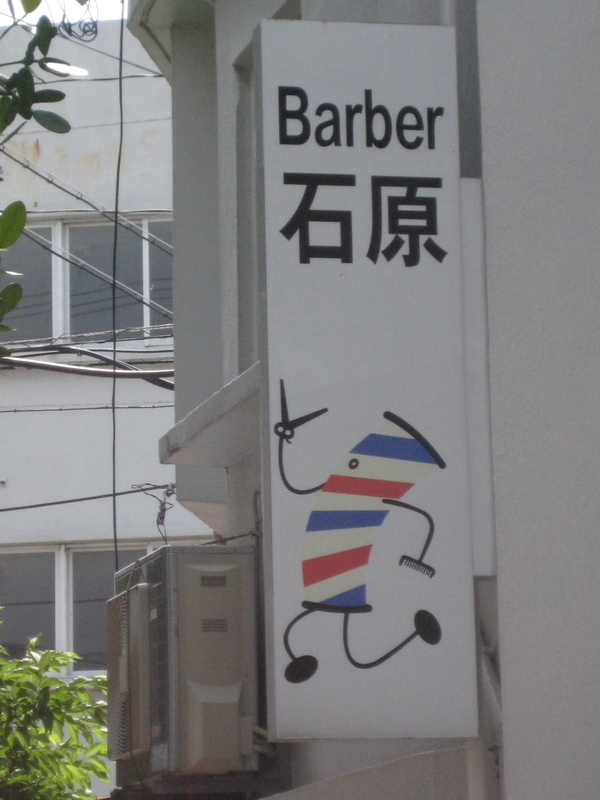 But when in Naha, right? 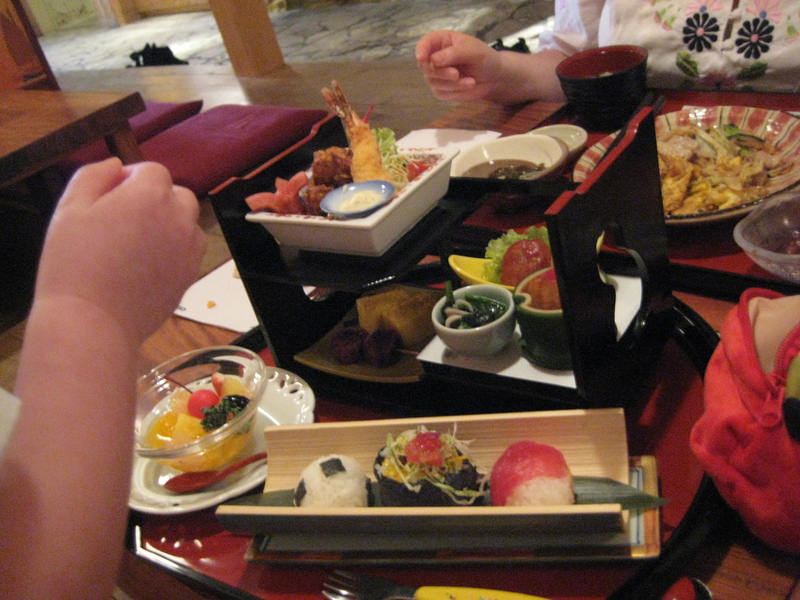 I feel like there’s a ton I’m missing on how we ate while in Okinawa. What questions might you have? p.s. I lied in my previous post. There was so much to write about the food that my next one will be about the wedding we went to. Suspense! Last week I had you glued to your screen with a recap of how our wee family survived nearly a full day of travel on three hours of sleep. Riveting, I know. Before I continue with what we did while in Naha, Okinawa, I want to add another item of importance when traveling with children: pack clothes in a carry-on for yourself. Why? Because kids puke and poop, and when you’re wrangling them in small spaces, it sometimes gets on you. While I didn’t get sprayed during this adventure, I’ve heard plenty a story of someone who had to sit with a pee-puke-poop stained shirt or pants for six hours. So, pack changes of clothing for your youngster and yourself. 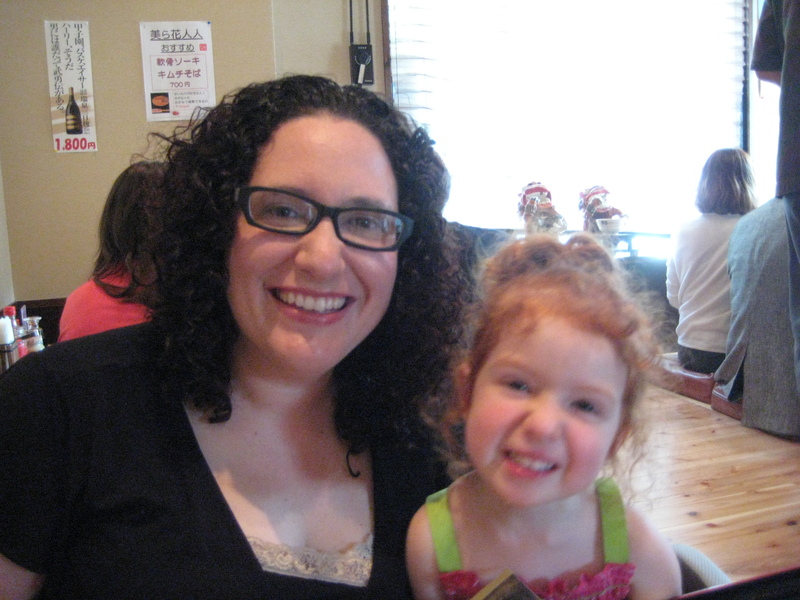 What did we do with a 2.5-year-old in Okinawa? Fortunately, we had our cousin’s family as hosts the first two days, and they graciously ferried us around. 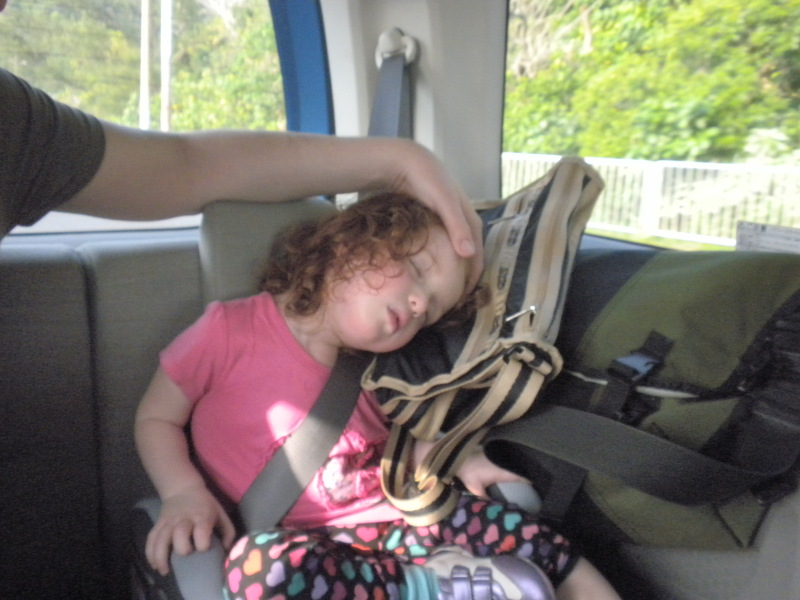 Our first adventure was heading to the Okinawa Churaumi Aquarium. Our hosts rented two cars and we set out for the northern part of the island. 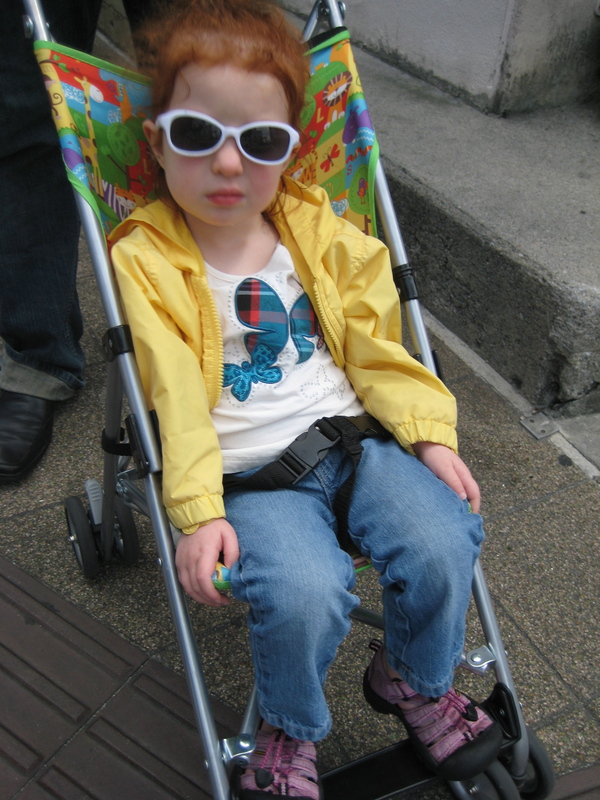 A note on traveling with a car seat. 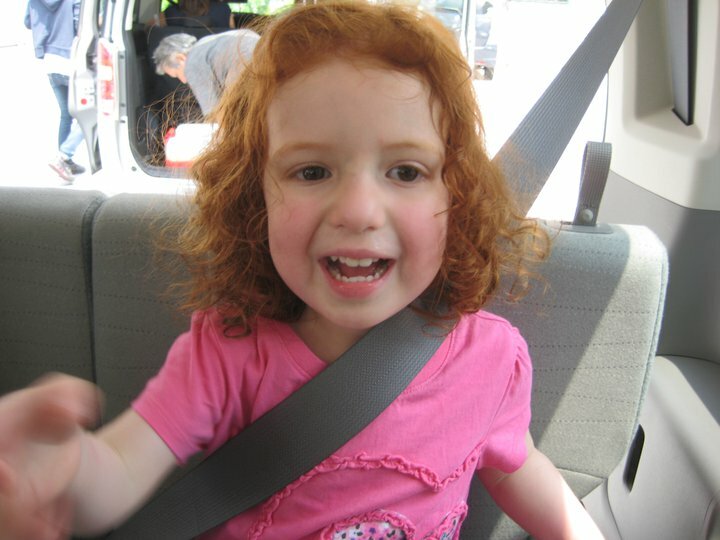 Miss Red has the proper car seat at home, but we weren’t sure what would fit in Japanese cars and needed something we could throw into taxis as needed, so we purchased a booster seat intended for older children. I know that this isn’t exactly safe, but we wanted some type of added safety, and considering we saw kids riding on laps in the front seat, I think we were OK. And it worked perfectly, since we took taxis almost daily – we literally threw it in, buckled her up, and off we went. The drive took about an hour and a half and was a nice way to check out the scenery. Everything was so lush along the roads – flowers, flowers and more flowers. And an awesome sign of a warthog crossing, but I never got it on my camera. The aquarium was wonderful. 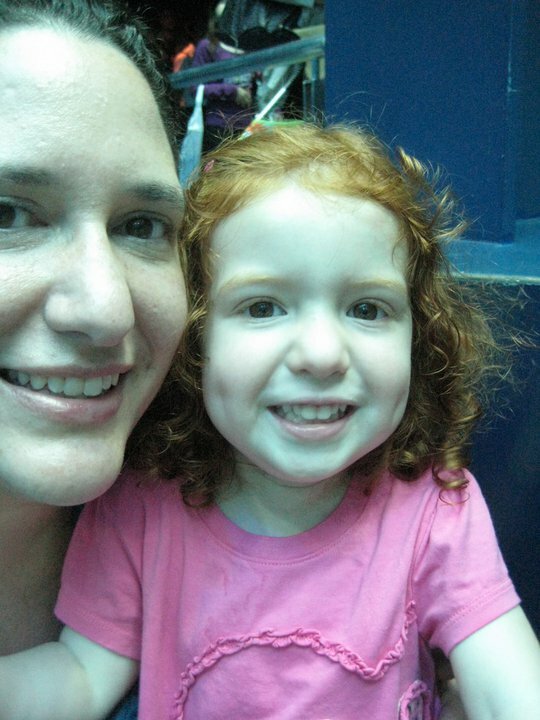 Miss Red loved seeing the fish and happily walked around the second largest aquarium in the world. I finally started to relax and feel like I was on vacation. We dodged mobs of school kids in matching uniforms, fighting to take pictures of the enormous tanks. 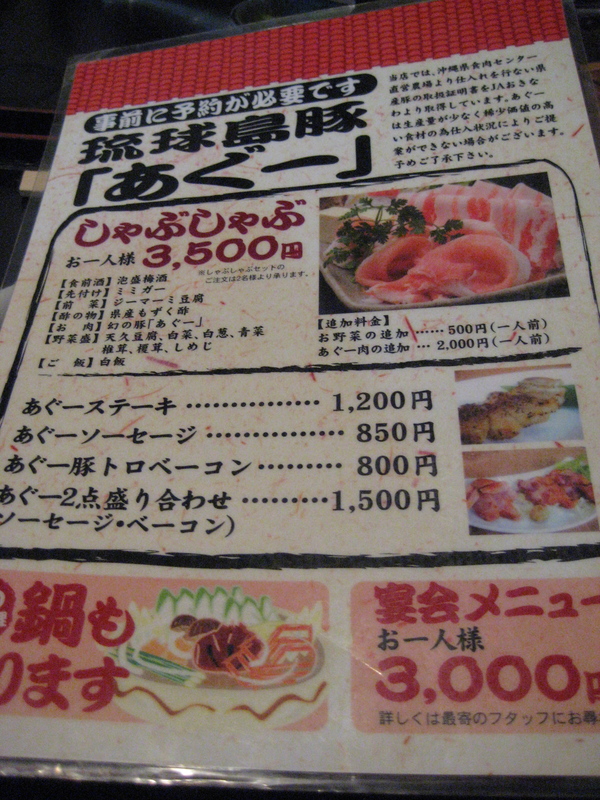 Here was also the first time I really wish I understood some Japanese, so I could understand descriptions of the fish. 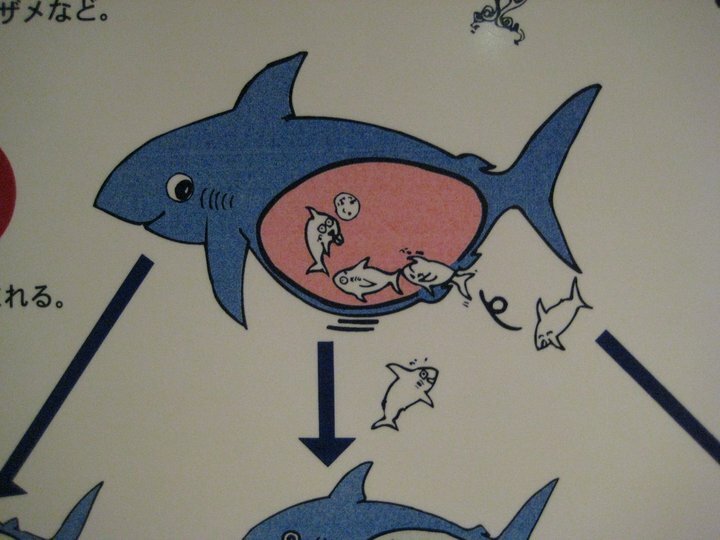 All you need to know about how sharks are born. With the drive, lunch and the aquarium visit, we were wiped, and opted to head back and rest before dinner. Miss Red and Grandma konked out. I stared out the window. Long day. Two bags and daddy's hand as head rest. How did we get through the day? Juice boxes and animal crackers. Letting her walk everywhere and explore. Effectively tiring her out. She never woke up from the car ride and slept until about 4:30 the next morning. Also titled: How we survived 20.5 hours of travel and a 14-hour time difference. And I’m dividing this post into a few posts. Why? Husband has a cousin who lives there and married a woman from there. We went for the wedding. How did you pay for it? Luck, actually. Found and sold heirlooms. I’ll tell you more if we’re actual friends. How in the world did we get there with a toddler? Lotsa planning. I’m a planner. I’m also very goal-oriented. So once we booked the tickets, I started a huge mental plan to get us ready. It involved getting Miss Red’s passport and signing up for an international driver’s license, which I thankfully didn’t need. And thinking about packing. I’ll skip the boring parts about packing, but highlight what helped as I outline how we made it there. Husband, Grandma (mother-in-law) and Miss Red and I jammed into our 2003 Honda Civic for the 2.5 hour drive. That was actually a loooooong drive. 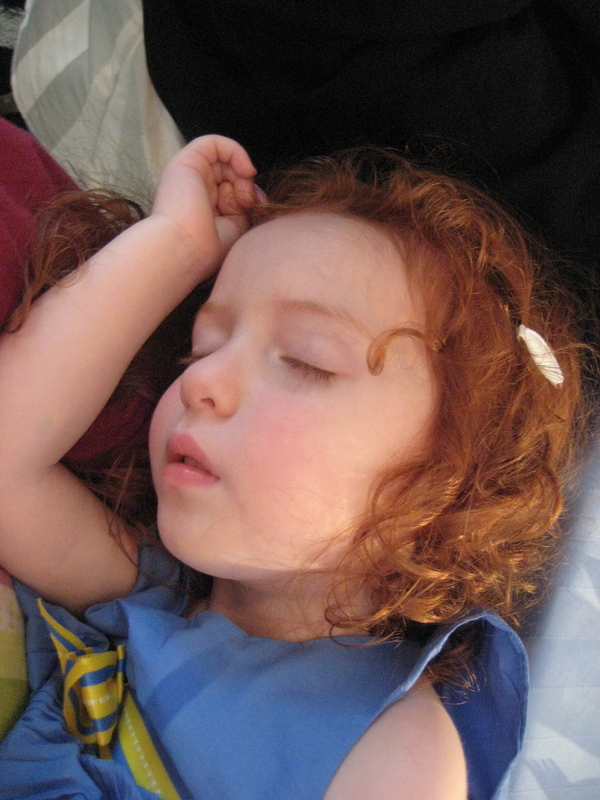 We had to wake Miss Red, she was crabby, Grandma sang to her, she ate a lot, she faked poopy diapers. Long-term parking was a nightmare. Also, Miss Red dragged her blanked through cigarette buts and some unknown substance immediately. I don’t even remember this much, except that we couldn’t find Grandma for a while because we were on the elevator with our bags and we lost her. By the time we checked in, snagged a bagel, caught up with another cousin on the long flight, it was time to board. And we had given ourselves nearly 3 hours to do this. So no joke about getting there early. I had gone to the Dollar Store to get scores of stickers and coloring items and general crap to keep Miss Red occupied for the 12.5 hour flight. We also thought she would sleep for at least six hours on the plane. I packed pjs for her, did the toothbrush routine, read stories, etc. Ha! What ended up being the lifesaver was that my husband insisted we bring our new, shiny, MacBook. He is so smart. What worked? Endless DVDs. Get kid headphones. Just do it. 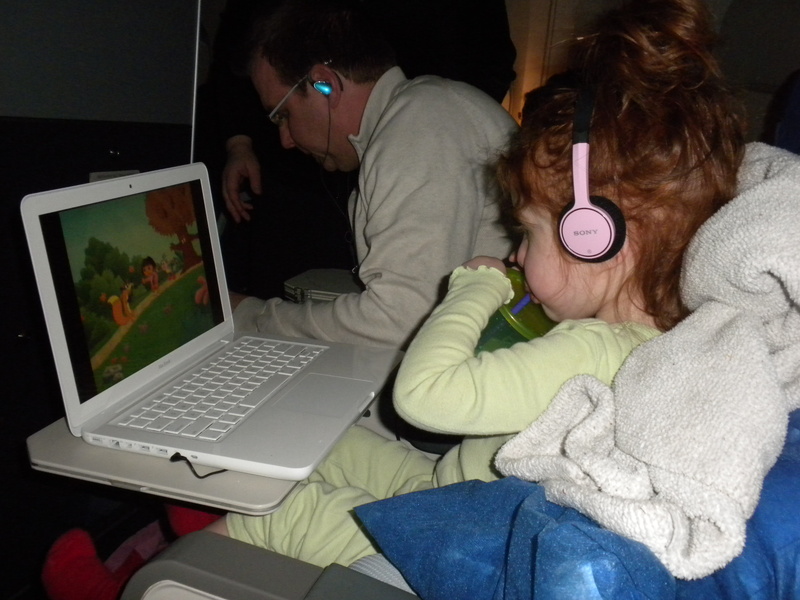 We also put a few episodes of Sesame Street on the iPod, which was essential for the long immigration lines. THE LAPTOP. OMG, NEVER, EVER TRAVEL WITHOUT ONE. Sweet, sweet laptop. Cups with lids and straws. The airline won’t have them. We brought 2 – one for milk and one for water. Shelf-stable milk. Honestly. It’s expensive, but the mini ones were live-savers. Trader Joe’s Applesauce packets. They are an insult to the environment, but we went through 4 boxes our entire trip, and that was even while rationing them. How did she do? Well, ok. Here’s the truth: out of the entire long flight, she slept the last 45 minutes. Seriously. So we were whacked out of our minds. The adults, that is. She was in good spirits. So clearly there were language barriers, but this involved immigration, getting our bags again, and having our stroller taken away in place of an ANA stroller. But people were nice. 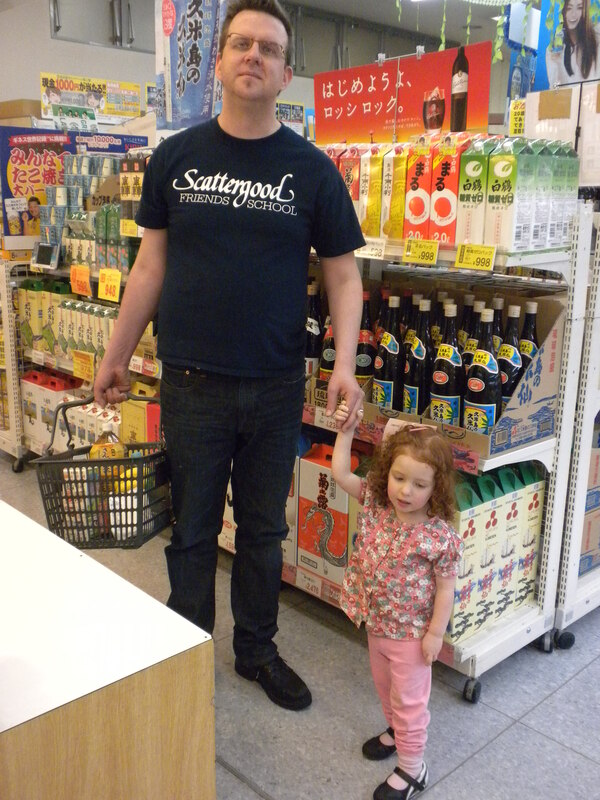 We met up with the rest of the American family headed to Naha and relaxed a bit. Miss Red was getting cranky, but a stranger gave her a toy. Yep, creepy as it sounds. We changed her clothes and re-charged the sacred laptop. 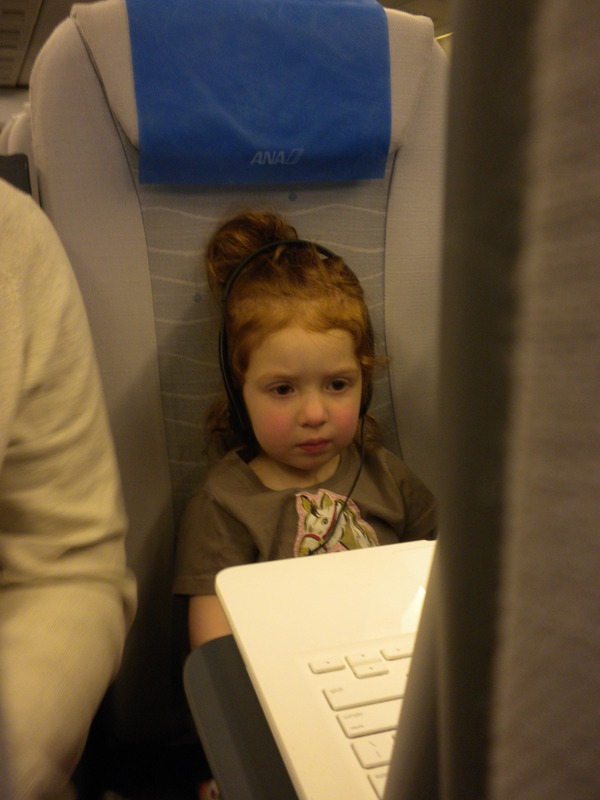 We then had another nearly three hour flight to Naha. By now we were very tired. But I spoke with a few women traveling alone with children. One woman had 6-month-old twins and made the journey herself. There are American bases in Okinawa, so there were a number of women and crew-cut Americans on our flights. Almost as soon as we got on the plane, I needed to sleep. We set up Miss Red again, and soon she fell asleep, too. The cool thing about this flight was that they have a camera on for take-off and landing, so you get to see on a large screen a lot of the scenery. They then switched to Japanese TV, which I could have loved to watch, but I was so insanely tired. We arrived around 8:45 p.m. in Naha. The next day. Like, we left on Tuesday afternoon and made it to Naha, with travel and the time change, on Wednesday night. It was warm and lovely. They have orchids all over their airport. Family was waiting for us, and we took 3 taxis to our hotel for the 11 of us visiting from America. One taxi was almost all luggage. No joke. Once we arrived, the Okinawan family our family member married gave us great gifts, and the three of us bowed out of dinner and drinks and headed to bed. Miss Red? She had been passed out since the plane, the taxi ride, etc. We put her in the crib, opened the screen door for fresh air, and collapsed. The best part of being awake, for, oh, how many hours? Well, when we went to bed, it was night. When we woke up at 3 a.m. the next morning, none of us had jet lag. It was actually great. 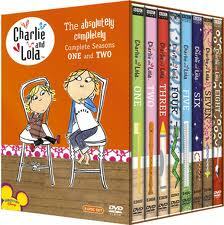 We hung out in pjs, watched Charlie and Lola (thanks, RBVH!) on the sacred laptop and bathed, making it downstairs right when breakfast started at 7 a.m.